I felt this one deserved a thread of its own. TORCH SONG TRILOGY will be making its TCM premiere on the 26th of September. It's one of Robert Osborne's picks that evening, and it follows Joan Crawford's TORCH SONG (which is an altogether different sort of story). It's been years since I've seen Harvey Fierstein's film, and I'm glad TCM is broadcasting it. If anyone's seen it before (or seen the play), please share your thoughts...! The play is great - the movie is ok.
Why do you feel the movie isn't as good as the play? The play is very theatrical piece specially the first two acts- the final section is the one that works better as a movie material. Harvey is great stage actor but it's kind of hard to believe that all these hot men are falling in love with him- ( yes I know if I was starring in a movie I would have Matt Damon playing my boyfriend) To be fair I have not seen this in a while so I might change my mind with a second look. Yes, I think it will be interesting to take another look at it. Though I have a feeling it will be very "dated." You could be right about the movie appearing dated now, but the play was the premier statement piece of it's day, probably until the arrival of "Angels in America". The movie was a welcome addition to the limited (at that time) category of gay-themed cinema, but it definitely skewed warm and fuzzy, while the play was a good bit darker and was also incredibly anarchic for something which won such acclaim on Broadway. I remember sometime in the 70's seeing Harvey in a local club trying out material, particularly a monologue (which made it into the play) by a gay man in a bar being "entertained" from behind while simultaneously sharing his thoughts on life with the audience, with ocasional instructive asides to the invisible guy behind. Not your standard Broadway fare. The film industry could have done so much more with him than it did. He pulled off his high profile "gay sidekick" roles in Independence Day and Mrs. Doubtfire with real skill, but it's a shame he wasn't given more range in his roles. In an HBO production of his Tidy Endings he and Stockard Channing beautifully underacted as a gay man who had lost his lover to AIDS and the former wife of that man. The high point of the movie, for me, is the Dames musical number at the drag club where Arnold works. It's a rare chance to see Charles Pierce, the self-proclaimed "male actress" who was arguably the greatest female impressionist of all time. If this movie makes you a fan or if you already are, there's a recently published book on his career. God bless RuPaul and all his many accomplishments, but it's a cryin' shame we no longer have the like of Charles Pierce among us. The film industry could have done so much more with him than it did. He pulled off his high profile "gay sidekick" roles in Independence Day and Mrs. Doubtfire with real skill, but it's a shame he wasn't given more range in his roles. In an HBO production his Tidy Endings he and Stockard Channing beautifully underacted as a gay man who had lost his lover to AIDS and the former wife of that man. Excellent post, and thank you for adding your perspective and experiences here. My assumption about the film lacking the edge the play had (and this is based on comments I am reading because I've never seen the play)...is that whatever company financed the motion picture probably decided to make it warm and fuzzy so it would appeal to a slightly broader audience, thereby increasing box office and video sales. As a result, Harvey's original material was compromised. Stage play? - it was a marathon evening of a gay man's journey through a lifetime of experience. I had never seen anything like it - and I know that I never will. I'd say you're exactly right about that. I think we were supposed to feel "lucky" that any gay movies were made at all, even though the price was the dilution of anything really sensational. Though I would imagine the film still functions as a time capsule about gay life in the 1980s. That's one of the things I will be looking at when TCM airs it. And going back to what you are saying, and what Ray said in his recent post, what survives are these watered down adaptations of stage material. Probably the films have a greater audience than the plays do. For instance, when TCM broadcasts TORCH SONG TRILOGY in late September, a whole new generation of people will see this story for the first time...and chances are they won't seek out the play. That raises an interesting question. I wonder how often the play has been done. It was written from such a personal point of view with such a Harvey-esque main character that it would take a very special performer/actor to pull it off. Unlike rayban, I'm only familiar with the play from having read my printed copy. I've never seen a production and, to be honest, I've never seen one advertised. It may be one of those plays which are so associated with the creator that they're not revived much. Can't say. Yes, there must be a way to look it up. The Internet Broadway Database (IBDb) doesn't include off-Broadway productions. And of course, who knows how many times it's been restaged in other cities across the country during the past three decades. I agree that since it's a highly personalized story from Harvey's point of view, it probably hasn't been revived too often. Of course, I saw Harvey Fierstein in the original Broadway production (which was an Off-Broadway transfer) and the actor and the play seemed to be inseparable. I also saw his replacement, Jonathan Hardary (sp? ), in his first Saturday matinee performance - and that performance was a tour-de-force. So many performers take over for the star - and do actually give praise-worthy performances. They are not the same, they are different - but they can be compared - favorably - to the star. Yes...I don't mean stereotypes, but obviously Harvey's character is a certain 'type' that can be played by other performers who would be a good fit for the role. It might seem dated now but look at "Boys in the Band" which was reviled for a while and now was successfully revived- "Angels in America" had a much better TV adaptation. Yes, I thought about BOYS IN THE BAND when I mentioned TORCH SONG TRILOGY reflecting its age. These are time capsules about gay life in those decades. Yes, today, gay men, especially young gay men, are out and proud. But "Boys In The Band" is a time capsule of its' time. A film - a movie - should always be seen in the historical context of the time in which it was written. "Boys In The Band" came to us at the beginning of The Gay Revolution. Its' reputation suffered at the time. But that fact is no longer relevant. And for gay men who cannot come of the closet, "Boys In The Band" will always be relevant. I completely agree, Ray. Obviously, not all gay men are out and proud today. Some of the younger ones have already been pressured into marriages with women, knowing they are not straight. So yes, something like BOYS IN THE BAND, and the characters played by Laurence Luckinbill and Peter White especially, will continue to resonate. There have been two Off-Broadway revivals of the play. But it really deserves an all-star revival on Broadway. A great tragicomedy, if ever there was one. You're discussing THE BOYS IN THE BAND. 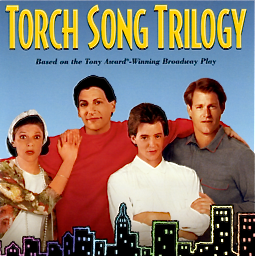 Have there ever been any revivals of TORCH SONG TRILOGY..? I agree. Obviously, if someone remade the film now, the telephone game in the last act would involve cellphones and probably be a texting game. But it would still create the same drama, the same emotions. Ate they going to use face book to stalk people ? Snapchat ? Skype?